Esri built its 2011/2016 Updated Demographics database based on Census 2010 counts. 2010 geography gives users the most accurate and useful data in current geographic boundaries. The 2011/2016 Updated Demographics database is provided in a variety of geographies and formats. With the release of its 2011/2016 Updated Demographics data, Esri is the first major data vendor to deliver demographic data based on Census 2010 counts and 2010 geography. Esri's 2011/2016 Updated Demographics data includes current-year estimates and five-year projections of population, households, families, average household size, housing, age, household income, per capita income, and race/ethnicity. Esri built its 2011/2016 Updated Demographics data from Census 2010 because it is the most current available. To ensure a superior level of accuracy, Esri's data development team used its benchmarked methodologies to carefully analyze and update the data and geographic boundaries. 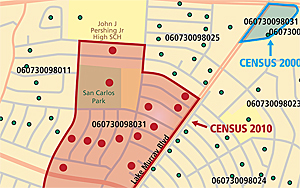 The Census Bureau can add new block groups to the inventory but also change the locations and boundaries of existing block groups. Here, Block Group 060730098031 (outlined in blue) shows its boundaries and location in Census 2000; dark red outlines its location in Census 2010 geography. The geocode is identical, but the boundary is completely different. 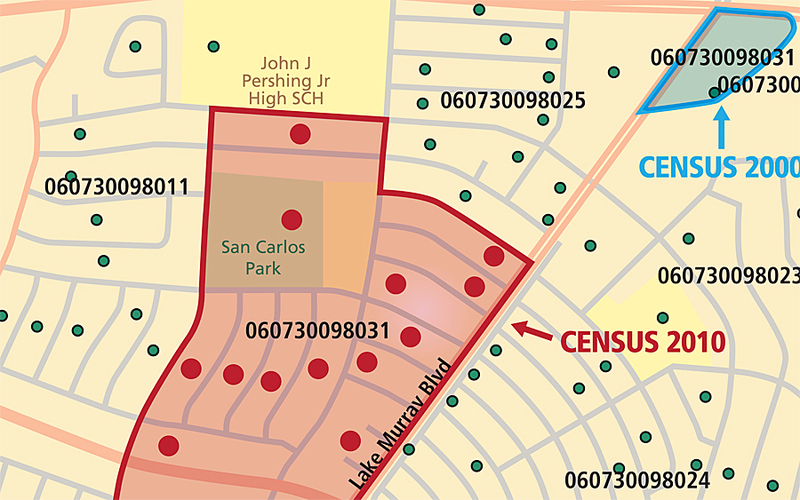 Therefore, performing population or housing unit analyses with current data or projections using Census 2000 geography would yield completely inaccurate results. 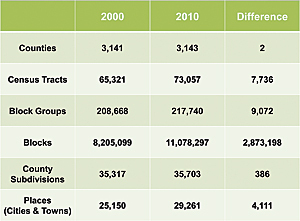 Census 2010 data revealed dramatic new demographic trends for the United States. Changes such as increased population diversity; post-Katrina migrations; and effects of the recession, including reduced household incomes and the housing market crash, occurred in the United States between 2000 and 2010. Data from Census 2010 captured these changes for the entire country. Why are these changes so important? If an analyst uses data from Census 2000, events such as the growth of the Hispanic population, increased home vacancy rates, and lower household income would be overlooked. This type of example is exactly why Esri built its 2011/2016 Updated Demographics data based on Census 2010. The Census Bureau reports significant increases in the geographic inventory since the year 2000. 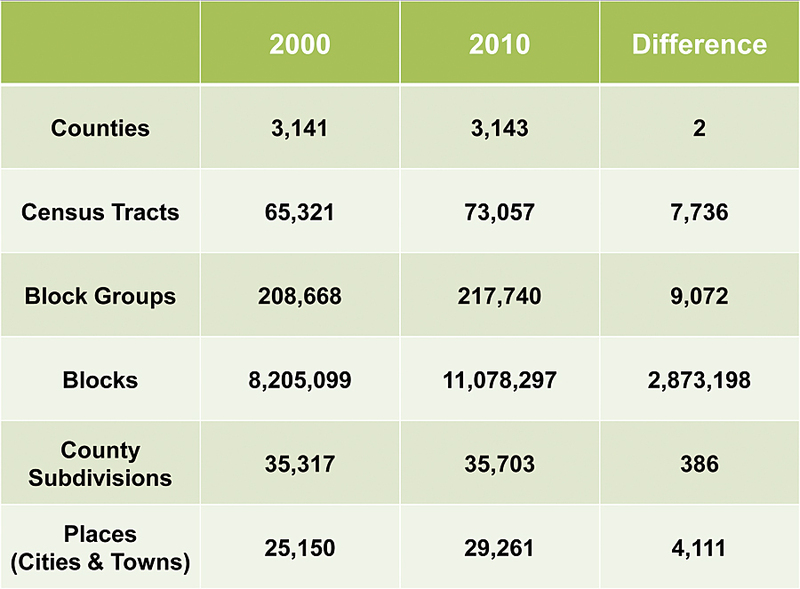 Note the dramatic increase in smaller geographies, such as census tracts and block groups. Simple updates to geographies could be mistaken as changes to the populations or demographics of an area. Performing analyses with geographic boundaries from Census 2000, now more than 10 years old, can result in skewed results, such as the failure to identify annexations. For example, if a block group doubled in size between 2000 and 2010, analyses developed with 2000 geography would not reveal the accurate population count in this geographic area. Agencies could miss areas where services are needed, and companies might ignore markets that could support expansion and perhaps provide employment for local workers. Basing its 2011/2016 Updated Demographics database on Census 2010 data and geography, Esri continues its history of using its proven methodology to provide users with the most accurate and useful data in current geographic boundaries. For data users, the data is available as a database in a variety of geographies and formats. The data is also available in the Esri Business Analyst Online product suite and Community Analyst. To learn more, visit esri.com/demographicdata or call 1-800-447-9778.